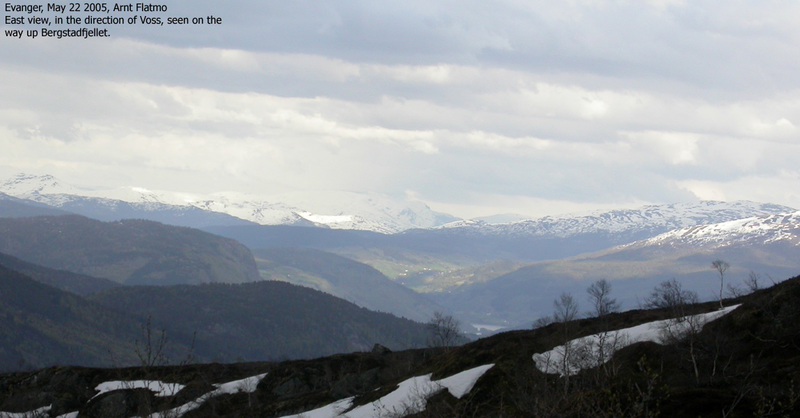 Bergstadfjellet marks the southern end of Blåvasshorgi - one of the most dominating mountains in the southwestern corner of the Stølsheimen mountain region. 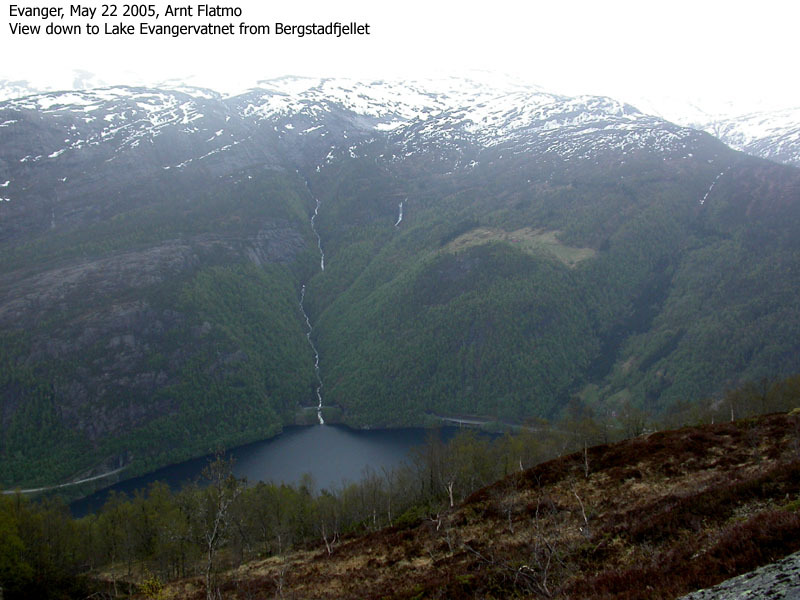 Bergstadfjellet is located directly above Lake Evangervatnet and can be approached from Rørgo and from Teigdalen. 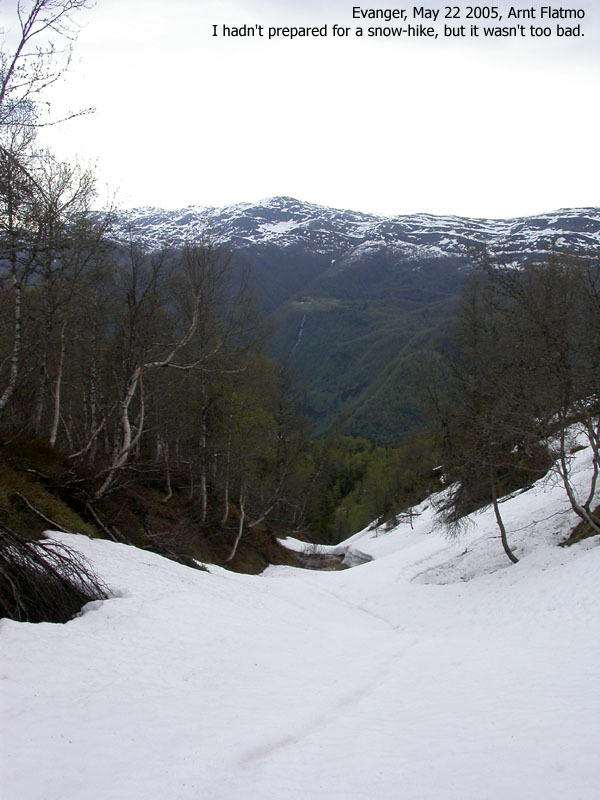 This page will describe a route from Teigdalen, the best place to hike this mountain from. 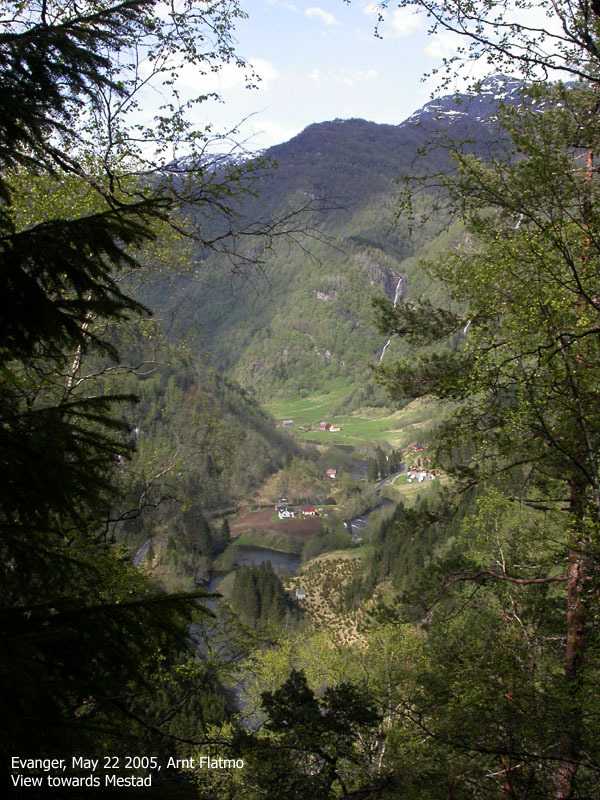 Bergstadfjellet is surrounded by higher mountains, and is far from being the primary viewpoint in this region. 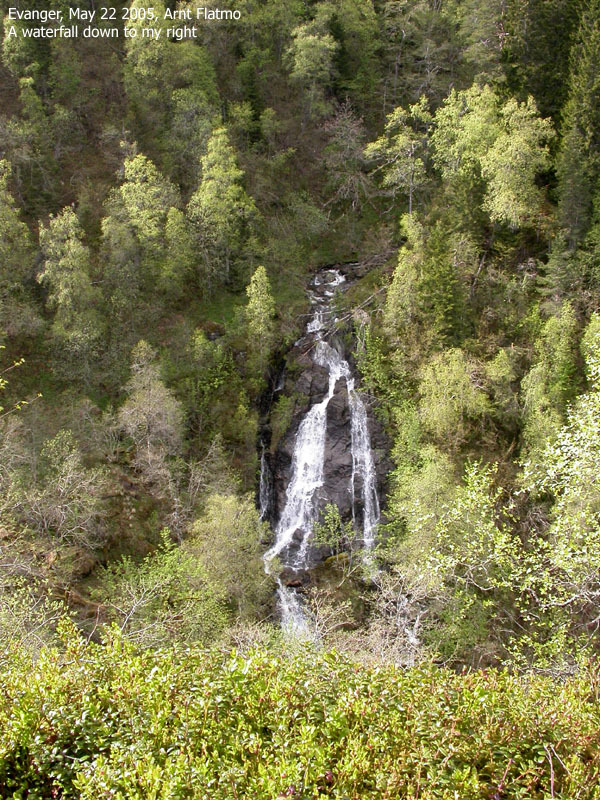 It is still a nice hike and can be strongly recommended to everyone. Note that the upper part of this hike is off-trail, which means you must be able to find your way down in all sorts of weather. 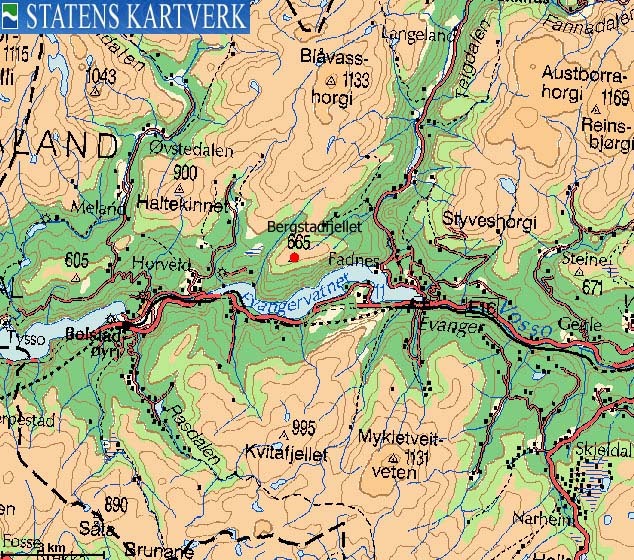 Bergstadfjellet (M711: 665m, Ø.K: 664,62m) has a primary factor of 117m towards the higher Blåvasshorgi (1133m). The saddle is found SW of Vindeggi. Ref. 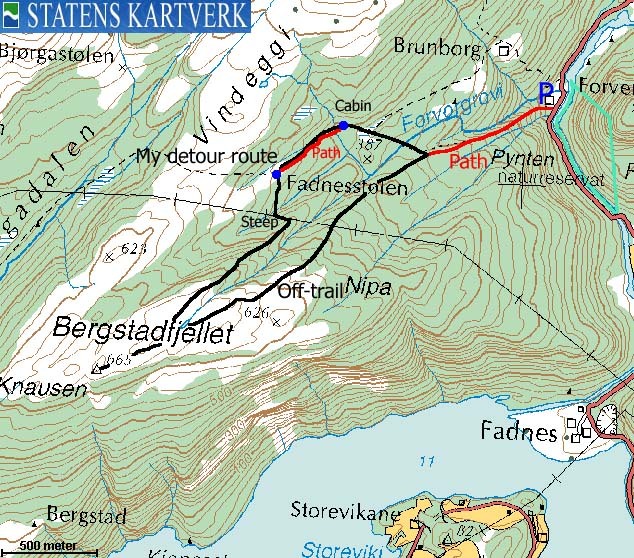 Økonomisk Kartverk (5m contours), you cross the 550m contours on the high route, but not 545m. The saddle height has been interpolated to 548m. 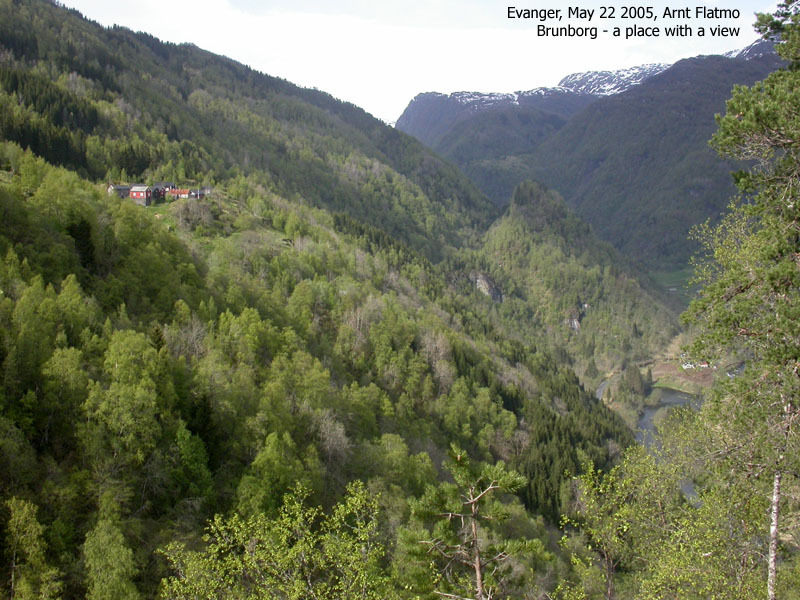 From Bergen, follow highway E16 towards Oslo. From the highway E16/RV7 junction at Trengereid, follow highway E16 46,3Km to Evanger. Turn left towards Eksingadalen. 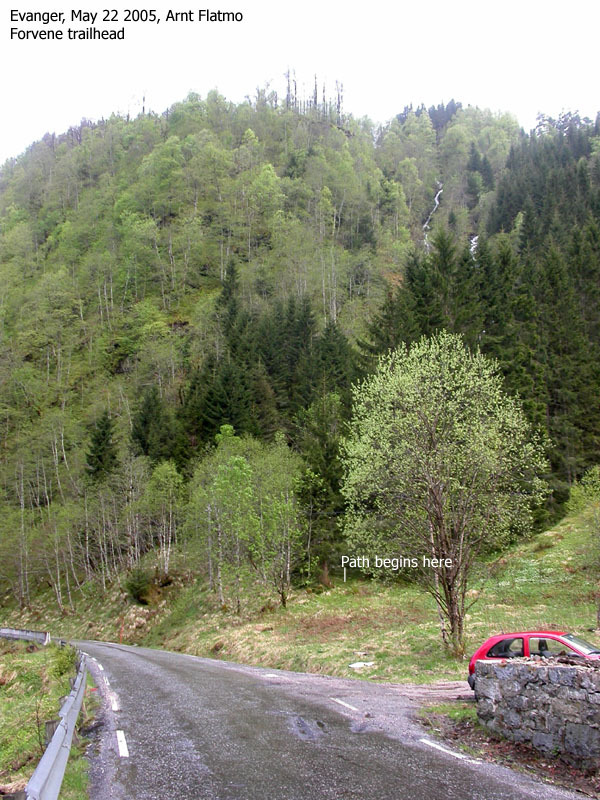 Follow the road up Teigdalen 4,1Km. Find parking on the left-hand side of the road. See trailhead pictures below. The obvious route is perhaps straight up the open field, but it isn't. 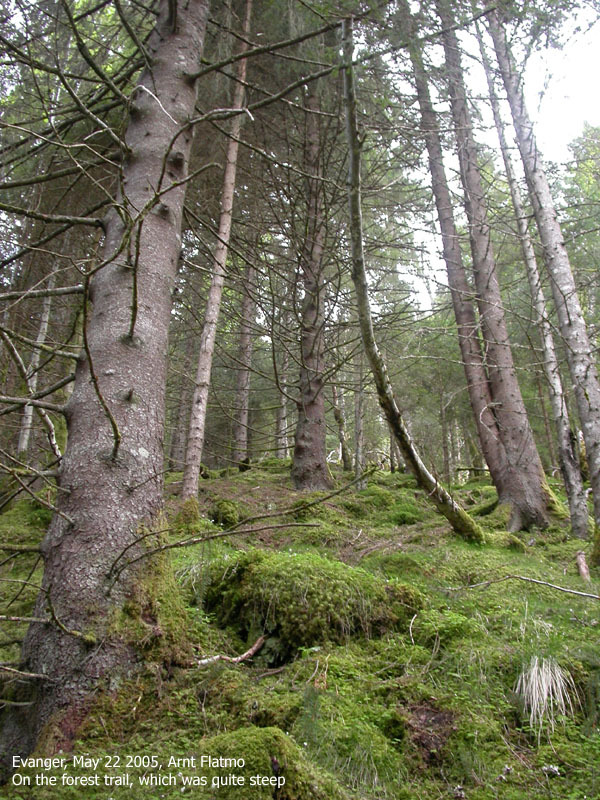 Seek left towards the forest and locate the path that runs STEEP up the pine forest. 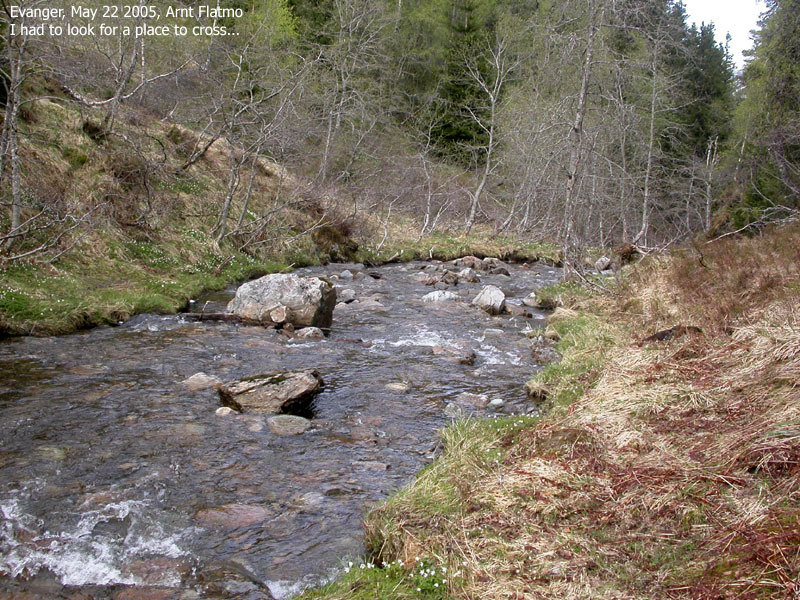 The path runs between two creeks and you join the creek to your left after a while. 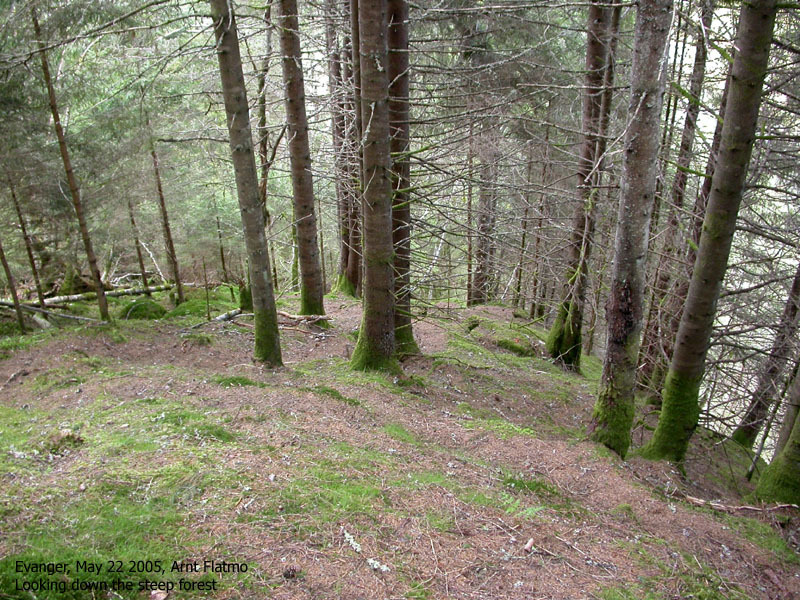 The terrain levels out after the pine forest and continues up a more and more distinct ridge. The creek on your right-hand side is now a small river and the drop towards it is phenomenal. At approx. 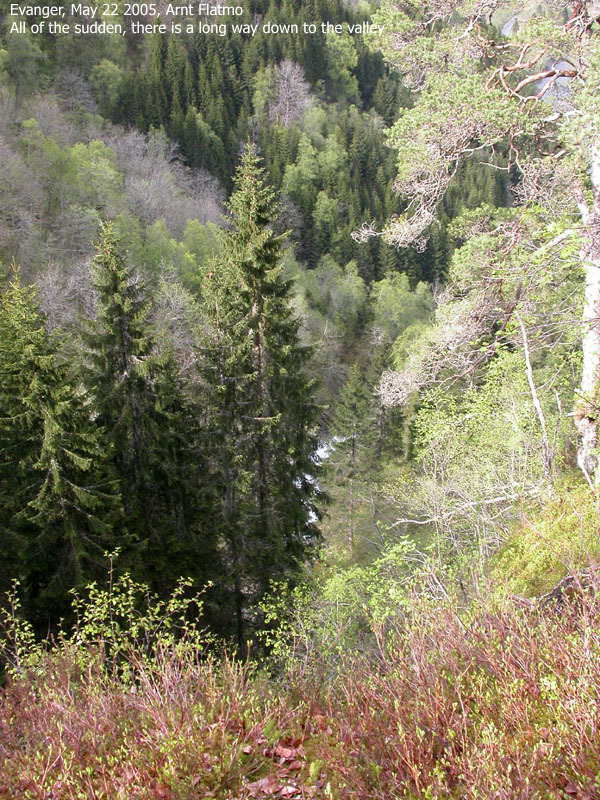 350m elevation, you will either lose sight of the trail or notice that it heads down to the creek down to your right. The drop is no longer phenomenal. Either way, stay on the ridge you're on (now off-trail) and maintain the southwest course up to the mountain plateau. It is fairly easy to walk up the ridge. No bushfighting or other obstacles. Due to work, this week-end offered only evening walks. I was on my way to Masfjorden Saturday evening, but turned around when a "wall of rainshowers" hit me at Åsane. I told myself that I really didn't FEEL for hiking anyway (no, I was not sick). The dog and I went to the top of Mt. Ulriken before I headed to the cinema and watched the return of the Siths while the weather changed to gorgeous outside. 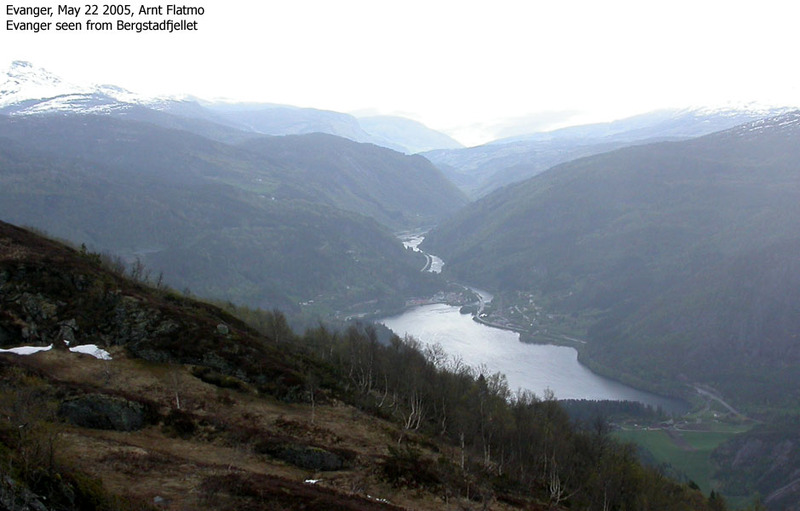 On Sunday evening, I headed towards Evanger after "discovering" Bergstadfjellet. 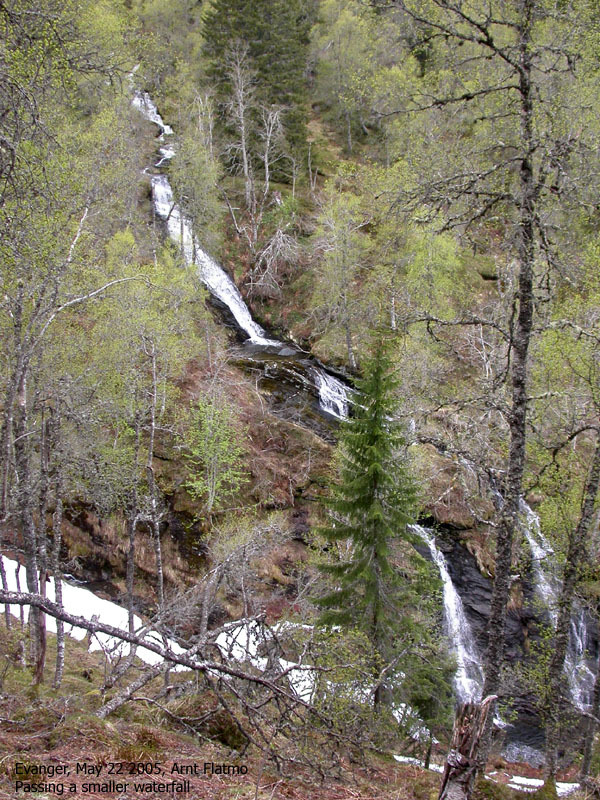 During a quick check of the to-do list for the nearby regions, I came across Bergstadfjellet. No bells rang at all. When I found it on the map, I was a bit stunned. I must have passed it 100 times without noticing it. And since it was even higher than Mt. Ulriken, there's really no excuse. 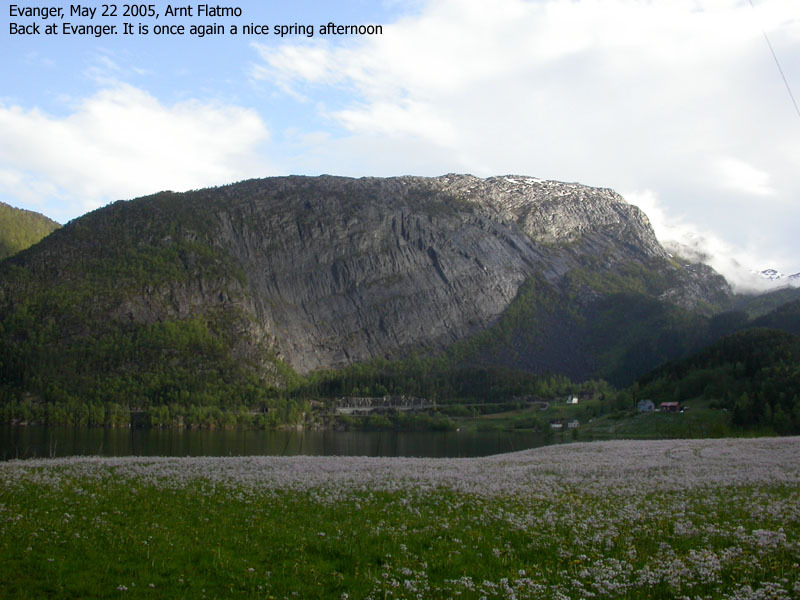 The fact of the matter is that Styveshorgi always attracts my attention when approaching Evanger, and this is the reason why I never noticed Bergstadfjellet. But now I was on the way to Evanger through a "wall of rainshowers". The weather was really disgusting, but at least the clouds didn't hang low down the mountains. 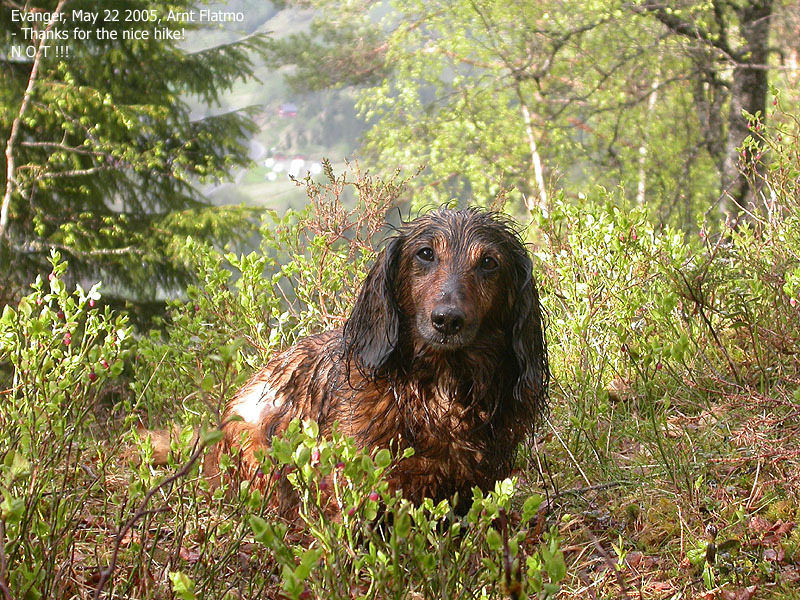 The worst that could happen was that I would get soaking wet, but the FEEL for hiking had been restored. As I left highway E16 at Evanger, I noticed that the sky above Voss was blue. Grr. Should I go to Voss? 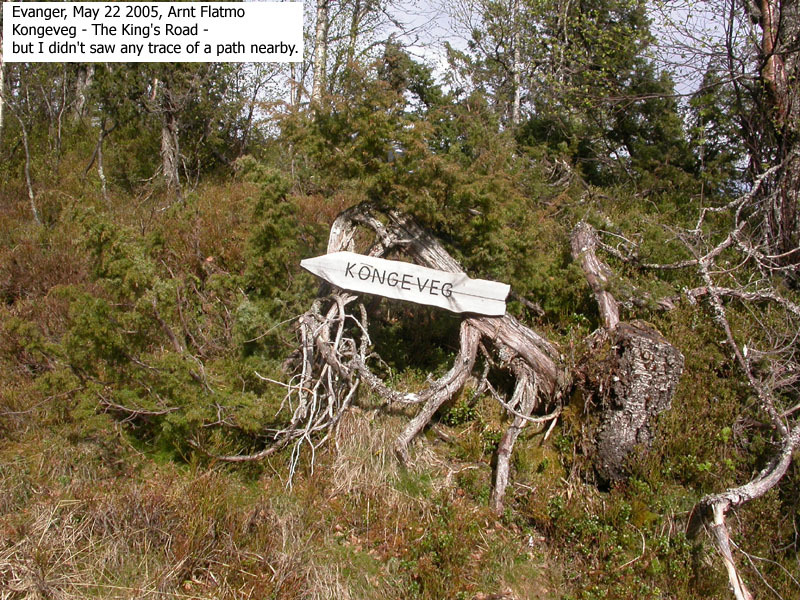 I had no maps of that area and besides, I had a plan with Sveinung Klyve to walk the lower Voss hills with our dogs. 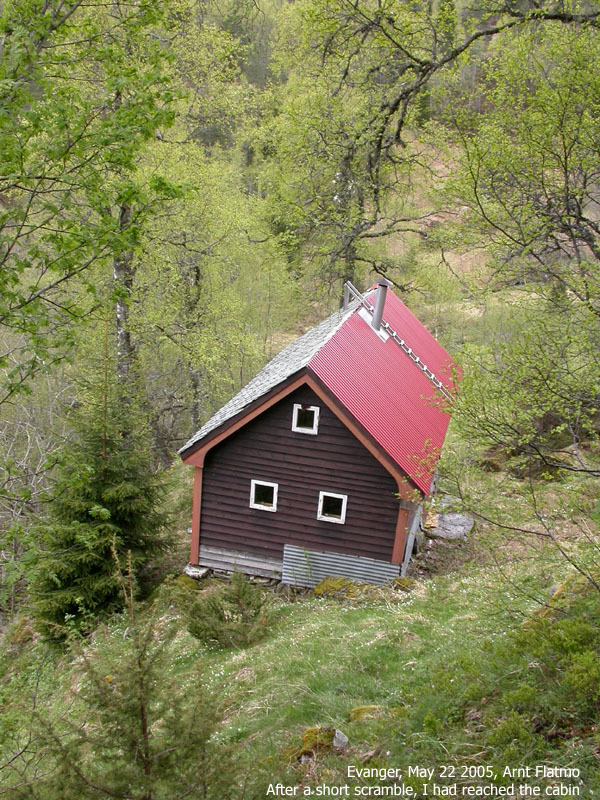 It had to be Bergstadfjellet. In rain. I parked the car 16:55PM and what do you know? Sunshine! 5 minutes later, we were on our way. 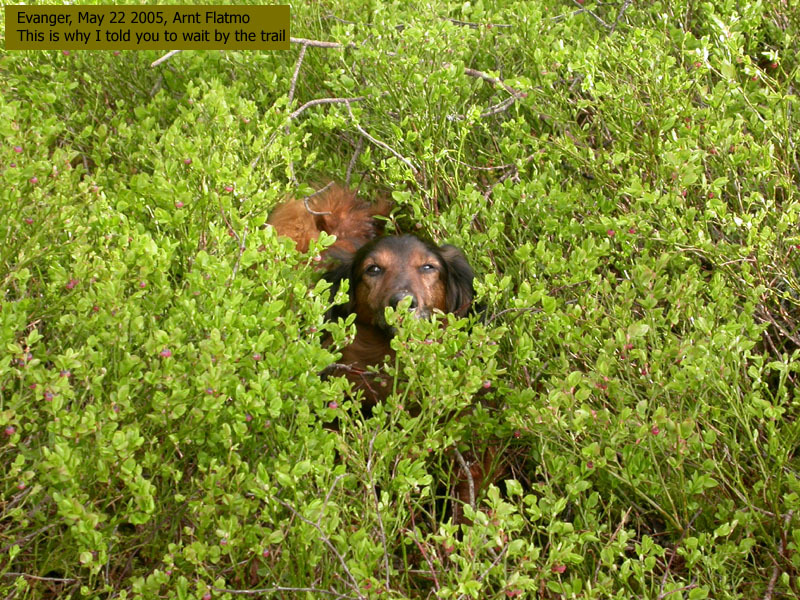 I missed the start of the trail and had to search around in the forest. 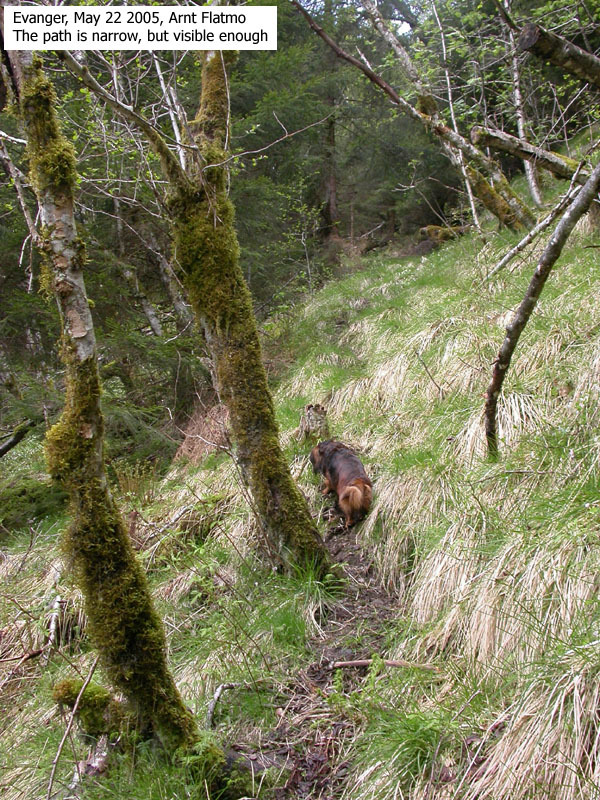 Then, after strongly urging the dog to walk up the path (it was one of the steepest paths I've seen), we were finally on our way. 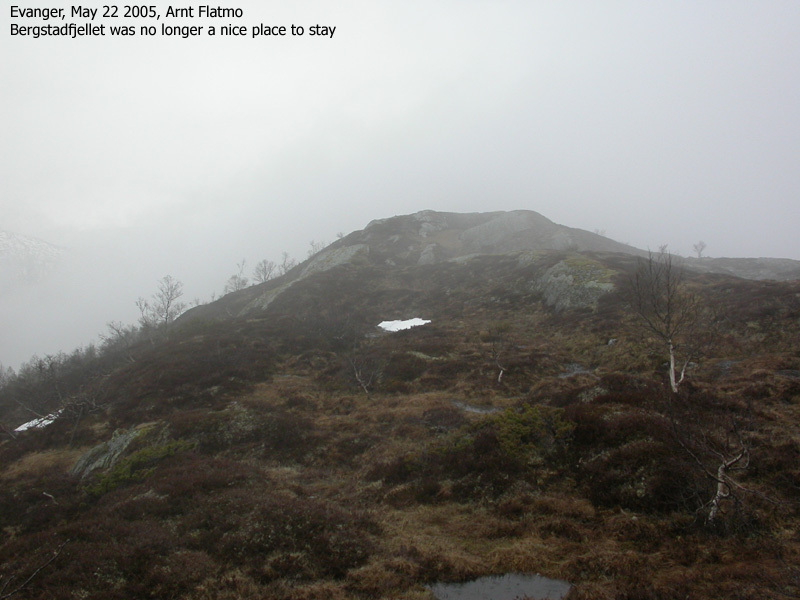 The map indicated that there would be a path all the way to Fadnesstølen (via a cabin) so I decided to follow this route and go off-trail up to the mountain from there. 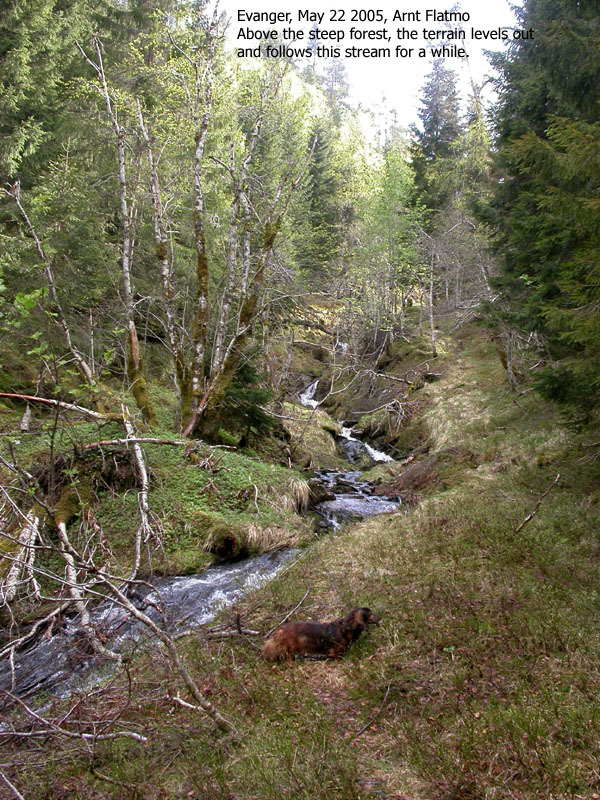 After a river crossing, there was no obvious path leading up to the cabin. Troll entered the backpack. 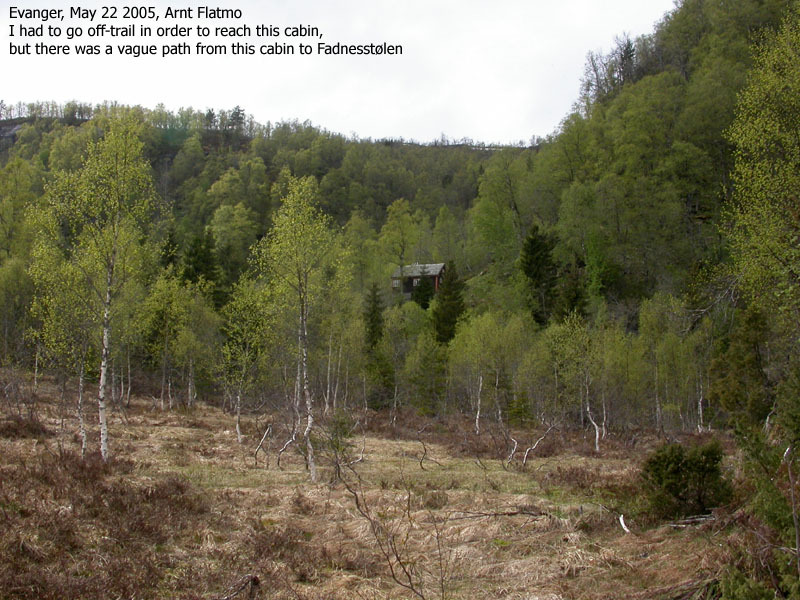 From the cabin, I was able to follow a vague path up to Fadnesstølen, which were ruins only. 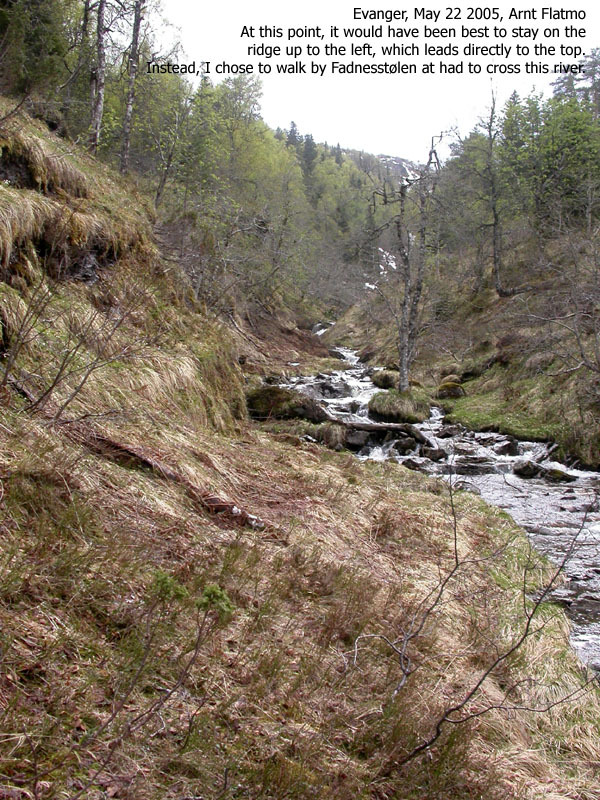 From Fadnesstølen, I descended down to the river and scrambled steep up to the ridge that I had been on earlier. I ran into snowfields higher on the ridge, but these never caused any griefs. The snow was not too rotten and carried sufficiently. Just before reaching the high point 18:50PM, it started raining again. The fog came in express speed and took away all visibility. I managed to take a few pictures before everything turned grey. Thanks to the distinct ridges on this mountain, it was easy to follow the terrain. I also took a compass course just in case. And in the pocket was my GPS (showing 665m on the summit), tracking my route. The level of security was ... overwhelming. When I reached the point where I left the trail (more precisely; where it ended), Troll was put on the ground again. He noticed a familiar sense and accelerated down the forest path. "slow down" is a command that he never learned. "Come on" and "wait" was well understood, but nothing in-between. 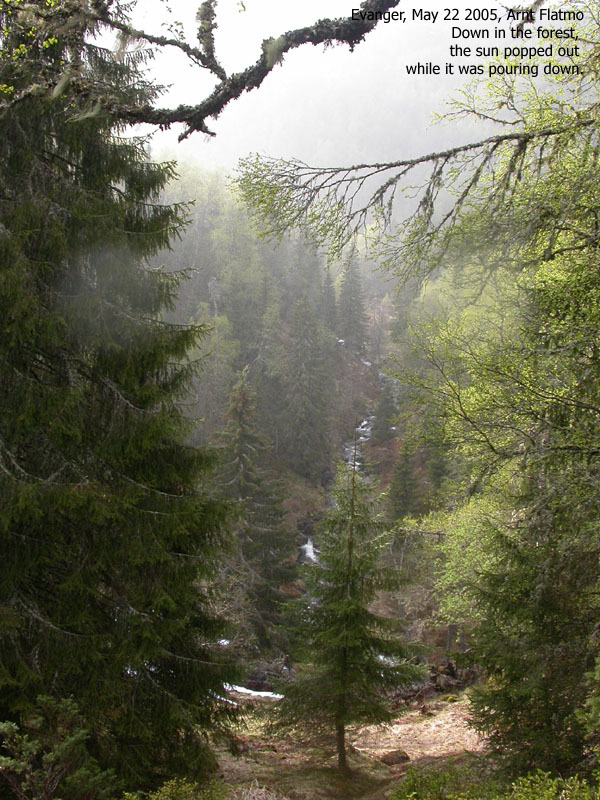 I tried to keep up with his speed, and looked like a raving lunatic in the steepest parts of the forest, completely off-balance on the wet and slippery forest trail. We reached the car 19:30PM and it had stopped raining. 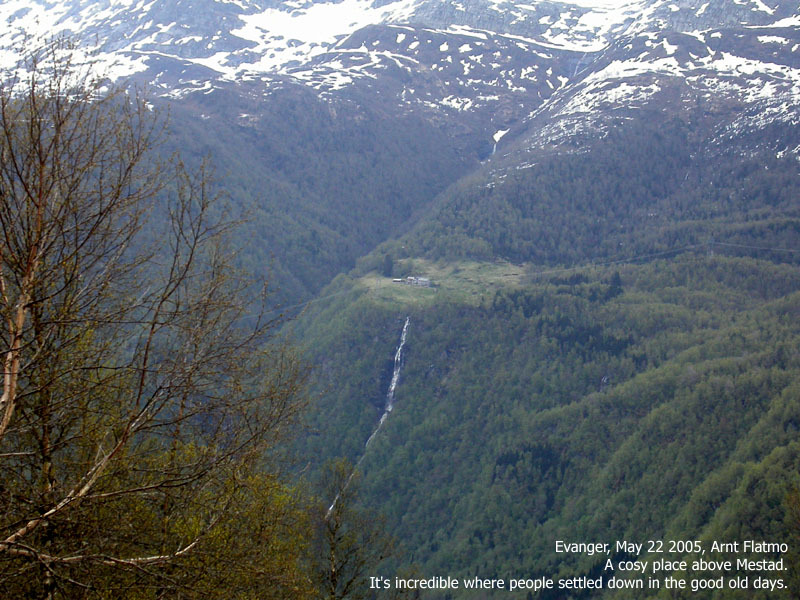 The sun was shining again, but lasted only until we reached Evanger. 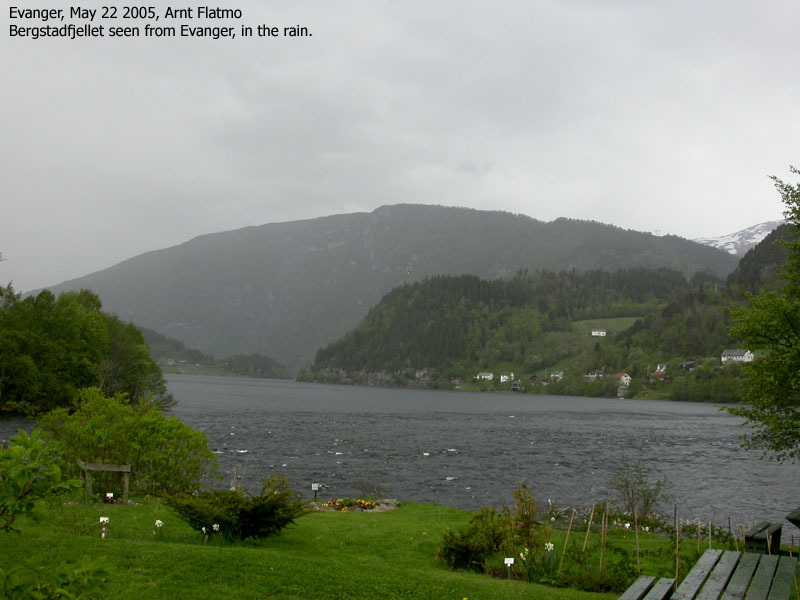 It was raining all the way back to Bergen. A good hike, which I would recommend to everyone.